During the pump sizing, artificial lift (AL) engineers usually deal with the problem of deciding the setting depth of the pump and the target production rate. There is a trade-off regarding the pump’s depth; the deeper the pump, the lower the free gas, the higher the potential rate, the higher the submergence but the higher the cost, and the higher the temperature. Why is the Well Analyzer software not detecting the acoustic shot when the gas gun acoustic pulse is generated? During normal operation, the Well Analyzer is connected to the Remote Fire Gas Gun by two cables. Rod Pump is one of the most used artificial lift systems worldwide nowadays due to reliability, robustness, durability, production ranges and low cost when compared to other systems. The versatility of rod pump lies in the possibility of applying it in heavy, medium or light crudes in reservoirs with relatively low pressures. How is a leaking standing valve displayed on a surface dynamometer card, a pump card and a traveling/standing valve test? The surface card is predominately used to display surface polished rod loads for the analysis of pumping unit beam loadings, rod loadings and gearbox loadings. The performance of a downhole leaking standing valve can be best displayed and analyzed on the pump card and on a traveling/standing valve test. 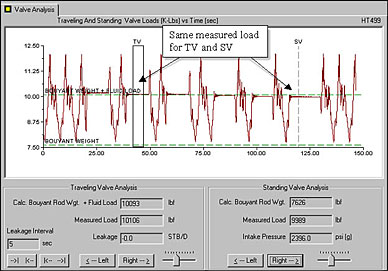 The surface polished rod loads and position/velocity data are used to calculate a pump card that can be visually inspected to determine standing valve performance. The pump card is a valuable tool to analyze downhole pump performance. When the plunger starts up and the traveling valve and plunger are operating properly, the load on the plunger will increase rapidly to the level labeled "A" in the diagram. During normal pump operation, the load on the plunger increases until the load is sufficient to lift the liquid to the surface. During the upstroke, liquid is lifted to the surface. When the plunger rises in the pump barrel, liquid and/or gas will be drawn into the pump barrel above the standing valve. When the traveling valve starts down, the traveling valve will remain closed until the fluid below the plunger is pressurized to a pressure in excess of the pressure above the plunger, which causes the traveling valve to open. As the fluid below the traveling valve is compressed, the fluid load on the plunger decreases rapidly if the standing valve holds to the level indicated "C" on the diagram. When the plunger is near the top and bottom of the stroke, the plunger speed is lowest. If the standing valve leaks at a moderate rate, the leakage will cause the load on the plunger near the top and the bottom of the stroke to be greater than the load at "C". Thus, the bottom of the pump card will be rounded (sections B and D) when the standing valve leaks at a moderate rate. A high rate of standing valve leakage in excess of the pump capacity will prevent the pump from producing any liquid. Following is an example of a pump card showing a leaking standing valve along with the corresponding surface card. During the standing valve test, the polished rod is stopped on the downstroke. When the plunger enters the liquid in the pump, the traveling valve will be open and the rod string will be partially supported by the liquid in the tubing. If the standing valve does not leak, the load on the polished rod will remain equal to the buoyant rod weight. If the standing valve leaks, the fluid load will be transferred to the traveling valve causing the polished rod load to increase. 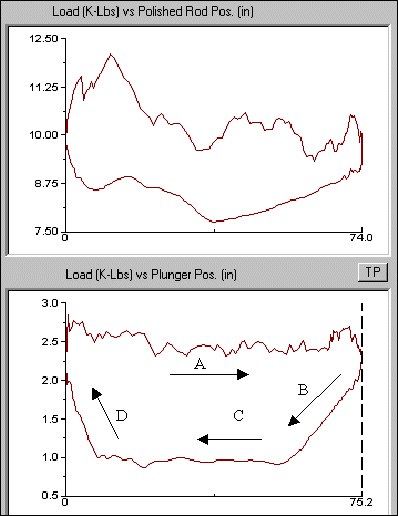 If the standing valve leaks at a high rate, the standing valve load will be measured to be the buoyant rod weight plus the fluid load as displayed below. A standing valve test that indicates leakage invalidates the traveling valve leakage rate test. The traveling valve test is difficult to interpret when the standing valve leaks. This document will help you troubleshoot and identify problems with acquiring data using your 30K or 50K horseshoe transducer. What pressures should be used in the Remote Fire Gas Gun volume chamber? CORRECTION METHOD ON SIMULATIONS IN PCP WELLS SETTING AN APPROXIMATION IN THE RELATIONSHIP GAS-OIL THROUGH GAS RATES CALCULATED BY THE SOFTWARE TOTAL ASSET MONITOR (TAM) IN CASE OF HIGH INCERTITUDE.